the motor wires are breaking. It's hard to tell from the photo, but I don't think there is any fix for that, short of re-winding the motor. I just don't think there's any way to make a trust-worthy solder joint that far up in the motor. You've got nothing to lose by re-winding it, so get some enamel wire, and start googling. In the short term, you may want to buy another motor. Some motors come from the factory with glue or epoxy reinforcing the wires where they exit the windings, which is a common stress point. Some people put glue or epoxy on motors that don't come from the factory with it. What if you screwed some hobby plywood or a popsicle stick into the motor (two closest holes) and then epoxied the new wires to the wood. That way you're not relying on the solder to hold the wires but the glue. The wood would give you something to glue to. Of course it's still a tricky solder job and you're likely to need to buy a new motor. But it's worth a try. Right? ... Right!? Part of the problem, if I understand correctly, is that at least one of the breaks is in the enamel wire itself. 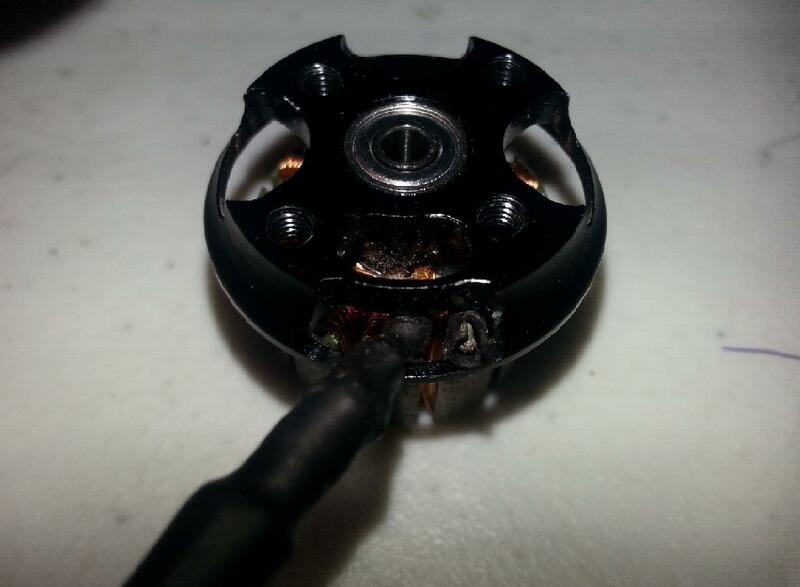 You can't solder that without removing the enamel, and that'd be near impossible to do without unwinding the motor. Not that you would want a solder joint in your windings anyway. You could take the broken wire and undo one turn to give a little more wire to resolder to but like the others said, it would be best to get another motor in the mean time. If you do fix it, put some epoxy on the wires to reduce the chance of it happening again.